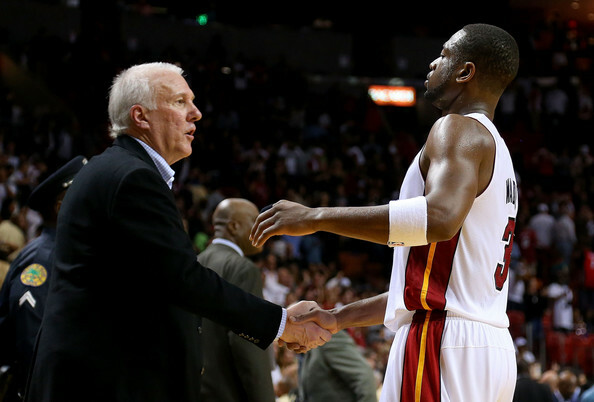 Heat And Spurs – A league of their own!! The Miami Heat and San Antonio Spurs are sitting in first place of their respective conference’s and not only that, they seem to be putting in dominant performances each and every night. Questions have been raised over Miamis inconsistency this season, particularly on the road! The Spurs to have their doubters, with extremely disappointments playoff performances in more recent years. The Miami Heat currently hold a record of 43-14 and are on a 14 game win streak. They are 6 and a 1/2 games ahead of the second placed Indiana Pacers and do not look to be slowing down. Miami are particularly good at protecting their home court, with a record of 26-3, as well as this they are currently 21-9 against Eastern Conference teams. The San Antonio Spurs hold a record of 47-14 and have won 19 of their last 22 games. They are 3 games ahead of second placed OKC Thunder and are equally as impressive as Miami at home with a record of 24-3. Within a competitive and extremely close Western Conference the Spurs hold a record of 26-10. The Spurs are currently ranked as the 4th best offensive team in the NBA (averaging 104.8ppg), with the Miami Heat a close second sitting in 5th position (averaging 103.7ppg). As well as this, Miami are currently ranked as the most efficient offensive team in the entire league. Now for defense, in terms of defensive efficiency the Heat are currently ranked in 10th position with the Spurs ranked in 3rd. With the most recent and extremely unfortunate injury to Tony Parker (sprained ankle) the Spurs may slow down in the upcoming weeks, however it is clear that both teams have established themselves as their respective conference powerhouses. So who wins out when these two teams face off? well Miami and the Spurs have only faced off once this season and as has been well reported the Spurs were without their ‘Big 3’ (Parker, Ginobili and Duncan), which resulted in a tough fought win to the Heat 105-100. These two dominant teams will face off once more on Sunday, March the 31st and it looks set to be an epic battle. Perhaps a picture of what is to come in the 2013 NBA finals series? Now honourable mentions are worth noting here. Firstly to the Knicks for being the only team in the entire league to beat both Miami and the Spurs on their home court and secondly to both the OKC Thunder (43-19) and the LA Clippers (43-19) for their strong performance thus far this season. With a 100 – 83 victory over the San Antonio Spurs, the New York Knicks capped off a clean sweep of the Spurs, their first in 10 years. In the only previous game played between the Knicks and Spurs this season, the Knicks were victorious in San Antonio 104-100. Carmelo only recorded nine points, as it was clear the Spurs were not going to give him anything, double and triple teaming him at every possession. This was a trend that continued going in to their most recent meeting, as Carmelo scored twenty three points (five below his 29.2 average for the season). Luckily for the Knicks both Raymond Felton (25 points) and JR Smith (17 points) stood up and bought home the W for the Knicks. In their most recent meet, a newly reinvigorated Knicks roster took the court to do battle with the ever-ready and experienced San Antonio Spurs. The Knicks starting line up was introduced, and both Marcus Camby and Tyson Chandler (20 rebounds between them) took the court , and with two former defensive players’ of the year it was clear that the Knicks defense was going to be ramped up. The Knicks only allowed 12 points in the paint, which is an impressive feat against a top five (currently 4th) scoring team when it comes to points in the paint. The Knicks defense held the Spurs to a sub-par 36.4% shooting from the field, and again JR Smith (20 points) was impressive off the bench, as well as Steve Novak providing a spark (15 points), with five of seven from the three point arc. Pablo Prigioni also chipped in, playing 27 minutes and dropping nine dimes with zero turn overs in twenty seven minutes of playing time, giving Jason Kidd some much needed rest and perhaps making up for the loss of Knicks guard Raymond Felton.